The vision of AnSem is to be the leading fabless ASIC Design Service company, by bringing innovation on chip. Its mission is designing and delivering state-of-the-art analog and mixed-signal integrated circuits to customers worldwide by successfully selecting and executing projects that serve as a reference to our skills. AnSem aims at delivering customer satisfaction that results in repeat business through identifying – jointly – customer requirements and expectations in terms of quality, performance, timescales and costs. In order to achieve its mission, AnSem invests in attracting and retaining the best technical staff, capable of closely working with customers in order to define the most appropriate chip. AnSem operates a customer oriented design methodology, focused on the requirements of the clients. Turnkey ASIC solutions based on a combination of in-house competences and a solid network of trusted suppliers and subcontractors. AnSem NV was established by Stefan Gogaert and Jan Crols on February 13th 1998 as a spin-off from KULeuven and imec. The headquarters are based in Heverlee (Leuven). On December 16th 2016, AnSem becomes an international company by establishing an affiliate design center in Enschede, The Netherlands. The customers of AnSem are mainly leading system OEM companies and (fabless) semiconductor companies, predominantly active in health, industrial, consumer and automotive markets. AnSem NV has more than 500 years of ASIC design experience and the team has completed more than 70 projects. AnSem is ISO 9001:2015 certified since September 2016 and carries the ISO 9001 certificate since 2007. To download our quality certificate, click here. We bring innovation on chip, flexible to your needs. As AnSem's Chief Executive Officer and Chief Operations Officer, Stefan takes responsibility for strategic alliances, Finance, HR and ICT. He is also involved in setting up collaborative research projects with other companies and research institutes. After his graduation, Stefan joined the group of Prof. Willy Sansen at the University of Leuven, Belgium, to conduct research on portable wireless EMG measuring systems and on integrated circuits for high-speed data communication. In 1998 he co-founded AnSem and grew the company successfully to a well established design service company with customers worldwide. Stefan Gogaert holds a Master in Electrical Engineering and a Postgraduate in Biomedical Engineering from the Catholic University of Leuven, Belgium. John Renard joined Cyient in 2000. He currently serves as President−EMEA (Europe, Middle East, and Africa) and also as Business Unit Head for Utilities and Geospatial. In this role, he is responsible for developing and growing Cyient's global utilities business, as well as maintaining Cyient's leadership position in Geospatial. 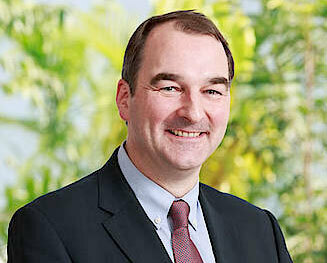 In his previous role, he served as geography and sales head for the EMEA and India regions. Before that, he managed the worldwide business operations of the Utilities, Telecom, and Data Transformation, and Analytics business units. John first served as Managing Director of Infotech Enterprises Europe Ltd. He led the European operations for six years before transitioning to his current role. With more than 25 years of IT, geospatial, and data engineering experience, John now specializes in financial management, strategy, business leadership, and global outsourcing. Prior to Cyient, John ran his own consulting practice in France, working with companies such as Andersen Consulting, La Poste, and Total (oil and gas exploration and production). In this capacity, he engaged with clients to deliver decision support applications and data-driven analysis. John lives in London and has a Master's Degree in Geography and Management Studies from the University of Cambridge. Suman Narayan heads the Semiconductor, IoT and Analytics business units at Cyient. In his current role, he is responsible for shaping and executing the Semiconductor business strategy, while growing key client relationships. Suman has over 20 years of experience in the high-tech electronics and semiconductor industry and has served in various leadership roles at ON (Fairchild) Semiconductor and Texas Instruments. In his last role at ON Semiconductor, he served as the vice president and general manager of the company’s P&L for the Intelligent Power Module business unit, growing cloud servers, and high-performance computing. Prior to that, he was with Texas Instruments for more than 18 years, where he was instrumental in incubating and launching the Motor Driver business for the Analog vertical. He was also responsible for growing revenue and profit for P&L for the Embedded Processor business based on ARM® and Digital Signal Processors (DSP) ICs, Embedded Software for IoT, video streaming, and automotive applications. Suman has held a range of positions in Texas Instruments, including product line director for the portable audio, video, and imaging group; director of marketing for the company’s streaming media business; and director of systems and applications for their mixed signal analog business. Suman holds a degree in electronics engineering from PSG Tech, Coimbatore, India, a master’s degree in electrical and biomedical engineering from the Iowa State University, and an MBA from the University of Texas, Austin. I would like to thank you for the great job you have done, the quality of your documents and your flexibility during the project. From my point of view this is exactly what we were looking for in a design partner. I will promote your company internally to check if we can initiate new projects with you. We have selected AnSem for their outstanding expertise in advanced analog and mixed signal ASIC as well as for their experience in ASIC turnkey solutions for innovative medical applications. AnSem has been able to understand very fast the challenges faced by this development and to proactively propose creative solutions to overcome them. The partnership with AnSem strengthens our own ASIC capabilities. Their expertise in RF and low power is outstanding and pertinent to our technology roadmap. Delivering working silicon requires close collaboration and team work. We succeeded despite the geographical separation. Ultimately it will offer an improved quality of life to many people suffering from hearing loss. EM Microelectronic has selected AnSem for their expertise in high frequency analog design for EM's next generation automotive and industrial products. Going beyond the state-of-the-art in low power, low voltage RF circuit design requires a very skilled and open-minded development team. Intense collaboration, skill and engagement between our team and AnSem's team were instrumental in achieving the results. Your privacy is important to AnSem. Does AnSem comply with the Belgian and European legislation? The organisation responsible for processing the information, AnSem NV, Esperantolaan 9, 3001 Heverlee, complies with the Belgian Act of 9 December 1992 on protection of privacy and the processing of personal data. As of 25 May 2018, the above-mentioned act will be replaced by European regulation 2016/679 of 27 April 2016 ‘on the protection of natural persons with regard to the processing of personal data and on the free movement of such data’ (the ‘GDPR’). This General Data Protection Regulation (GDPR) must be applied in the same way throughout the European Economic Area (EEA). AnSem has charted out the necessary processes for compliance with the GDPR, both in terms of data collection and data protection. · Personal data provided will not be retained longer than necessary for the related information exchange. · If external parties are involved in the data processing, AnSem shall take the necessary steps to ensure that these parties also comply with the GDPR. · All data processed via the website is secured via SSL (Secure Socket Layer) with encryption of all data. · If third parties are used in the processing of personal data, AnSem gives a commitment that these companies also operate in compliance with the GDPR. A. If you make a sales request – in person, via a website, e-mail, fax, by phone or in any other form – the personal data you provided will be used to create your customer profile in our ERP package in order to be able to answer your sales question. This data can be used by the Sales staff in their Outlook file for sales follow-up and by the marketing department in the e-mail program to keep you informed of events, new products and services and/or other marketing activities. Only if necessary for further sales follow-up of your request, this data may be passed on to third parties, e.g. distributors in specific segments or countries. B. If you register for our newsletter, the personal details that you provide to us will only be processed in our newsletter program via an .xls upload. By registering for the newsletter, you are giving your explicit permission for this. C. If you are a supplier, the data necessary for a commercial relationship will be treated as described in point A above. D. If you are a press contact, your data is merely maintained in a PR database, solely with the intention of being able to send you press releases from AnSem and any partners. E. If you are an employee, the personal details and household details that you have provided are passed on by the HR department to an external social partner for payroll administration, the granting and monitoring of fringe benefits, and/or other necessary personnel-related activities. F. If you are a job applicant but are ultimately not recruited, there is a possibility that the personal details that you provided in connection with your job application are subsequently kept in a central location in the recruitment reserve. This location is only accessible for a few authorized people. You have a legal right to inspect your personal data and, if necessary, request that it be corrected. Provided that you send us evidence of your identity (a copy of your identity card), you can make a written, dated and signed request to info@ansem.com for the attention of the Marketing Manager, asking to be sent a written copy of the personal data that we hold on file for you. If necessary, you can also ask to have the data corrected if it is incorrect, incomplete or irrelevant. In case of use of data for direct marketing: you can object, free of charge, to the use of your data for direct marketing or newsletters. In every automated e-mail, you have the possibility of unsubscribing, or you can send an e-mail to info@ansem.com for the attention of the Marketing Manager. You should be aware that once you have unsubscribed, you can only register again with the same e-mail address by sending a specific written request to the Marketing Manager. Automatic registration is no longer possible. AnSem can collect anonymized or aggregated data of a non-personal nature, such as browser type or IP-address, the operating system that you use or the domain name of the website via which you came to our website, or which you went to when you left our site. This enables us to continually optimize the website for users. AnSem will take the necessary steps to store the personal data provided in a secure manner and – if applicable – to transfer it. This can be in electronic or non-electronic form by means of hierarchical access control, logical access restrictions, the necessary IT firewall and IT back-up systems. ‘First party cookies’ are technical cookies that are used by the sites that is being visited, and which are intended to make the site function optimally. Example: settings that the user changed during previous visits to the site, or: a form completed with data that the user entered during previous visits.